Pour yourself a glass from the past at this Southern Indiana brewery. Champagne Velvet, one of Southern Indiana’s pre-Prohibition beers, recently found a new home at Bloomington’s Upland Brewing Co., where it’s a popular and approachable pilsner in the brewery’s lineup. Pete Batule, Upland’s head of brewing operations, says having the beer on tap tells a story about Indiana’s rich brewing heritage. 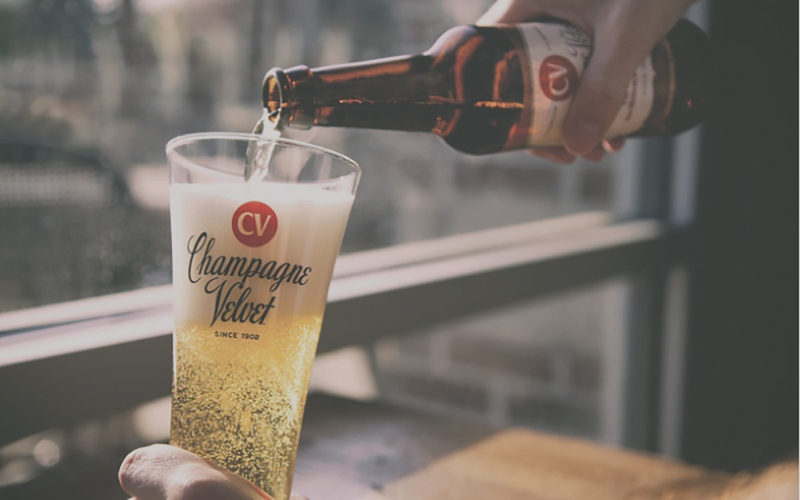 Back in 1902, Terre Haute brewmaster Walter Braun crafted a recipe for a new pilsner lager and named his creation Champagne Velvet. CV quickly became the crown jewel of the Terre Haute Brewing Co. and was sold in at least 30 different states, says CV enthusiast and memorabilia collector Chris Hallock. But CV’s biggest market was always in Indiana. “What made CV so special was its use of materials unique to Southern Indiana, such as flaked corn for the malt,” Hallock says. Prohibition closed the brewery in 1918, but when it reopened in 1934, the city celebrated with a parade and march composed for the occasion. After the Terre Haute Brewing closed its doors again in 1958, CV’s name bounced around smaller breweries, but Braun’s original recipe was lost, Hallock says. Then Terre Haute entrepreneur Mike Rowe stumbled on a diary with a partial recipe from Braun’s earliest batches of CV. Using the handwritten notes, Rowe revived Champagne Velvet at his own brewing company in 2000, Hallock says. In 2013, Upland Brewing Co. in Bloomington bought the recipe and developed test batches for the Terre Haute community to sample. “Even old ladies with walkers came to try our Champagne Velvet,” Batule says. Later that year, Upland launched its interpretation of CV, and it quickly became the brewery’s third-best seller. You can sip the century-old fan favorite at one of Upland Brewing Co.’s six locations in Bloomington, Columbus and the Indianapolis area. CV is also sold year-round in cans and bottles throughout the region. Pilsner: A type of pale lager with a strong hop flavor. Hops: Flowers from the Humulus lupulus plant used as flavoring agents in beer.